Home Explore Optiv Insights Downloads How Secure is Your Organization? When it comes to security, a CISO’s job is never done. Many factors go into a successful and secure organization. 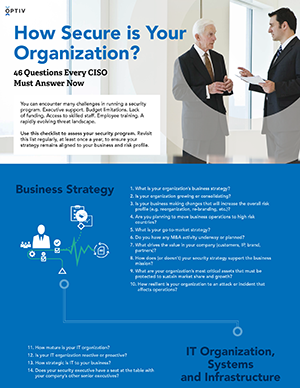 Use this infographic to assess your current security program and learn about 46 questions every CISO must answer now. Revisit this list regularly to answer questions on topics including business strategy, IT organization, systems and infrastructure, organizational culture, threats, regulations and global, social and political forces.